She loved to bowl, bike, knit, do puzzles, attend Badger games, go to band concerts, and play cards at the senior center. She made frequent road trips to see her grandkids or spend the weekend at a daughter’s home. 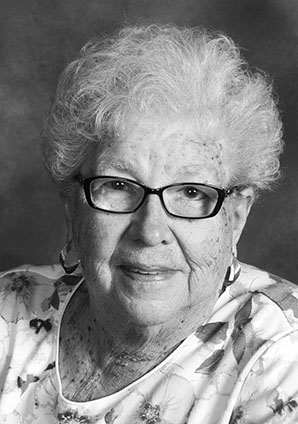 She was active in church life and enjoyed lasting friendships from congregations in Appleton and Madison. Lois is preceded in death by her parents, Clarence and Eva (Hock) Vandenberg, husband, Claude Hietpas, daughters, Kim and Robyn, as well as relatives from her husband’s large family. She is survived by daughters, Claudia and Dawn (Brian), four grandchildren, and sister, Marilyn Kuehl (Orlie). A memorial service will be held from 3:30-4 p.m. on April 13, 2019 at the Wichmann Funeral Home, 537 N. Superior St., Appleton, WI. There will be visitation from 2 p.m. until. In lieu of flowers, donations can be sent to the Lois Hietpas Memorial ℅Wichmann Funeral Home, 537 N. Superior St., Appleton, WI 54911. These gifts will support the senior centers in the Middleton and Appleton communities.